San Francisco – In 1830, a French farmer plowing his field near the village of Berthouville, in rural Normandy, accidentally discovered a hoard of spectacular silver-gilt objects that were deliberately buried during antiquity. The items, all dated to the first or second century AD, were dedicated to the Roman god Mercury and collectively became known as the Berthouville Treasure. 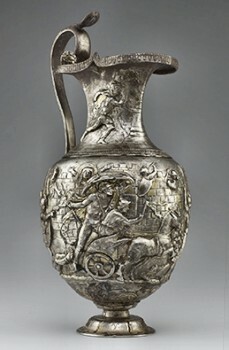 After four years of meticulous conservation at the Getty Villa this splendid collection of Roman silver comes to San Francisco in Ancient Luxury and the Roman Silver Treasure from Berthouville. The exhibition features more than 160 pieces, including selections from this find as well as precious gems, jewelry, and other Roman luxury objects from the royal collections of the Cabinet des médailles at the Bibliothèque nationale de France, Paris.